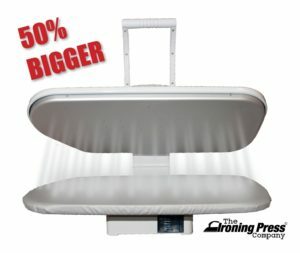 Many people in the UK are looking for the best steam ironing press. They are turning to these to speed up the length of time it takes to get the ironing done. There are quite a few different models to pick from. In this article I try to help you with the choices available. I have examined the ratings these are given by buyers, examined their value for money, and then ranked them in order. These are classed as professional ironing equipment. They are the type of ironing equipment that you would find in ironing shops up and down the UK. They are also used in dry cleaners and in some of the larger hotels and guest houses. Essentially, these are all about speed, and getting things done quickly. 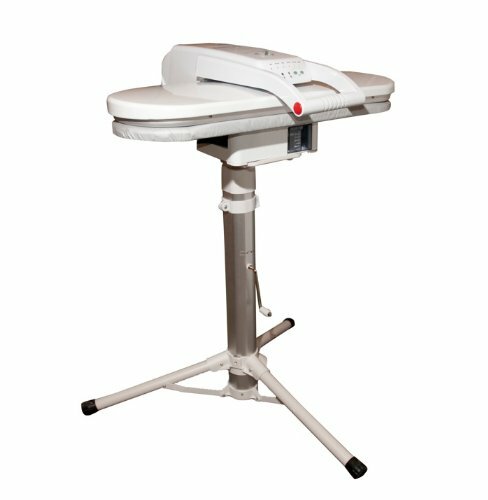 Who Would Buy an Ironing Press? 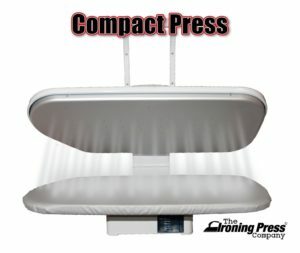 How Does An Ironing Press Work? It is always good to have a close look through all the buyer reviews to discover who buys items like this. When I did that, I was surprised by the different types of people, who made a purchase. Primarily as I have mentioned people tend to buy these to iron sheets, trousers, jeans and some larger items like curtains. Now on this website I recommend that people change from a normal steam iron to a steam generating iron. The disadvantage of using either of those is the weight of the iron. For many people that is not an issue. However for those who suffer from arthritis or rheumatism, that is most certainly an issue. 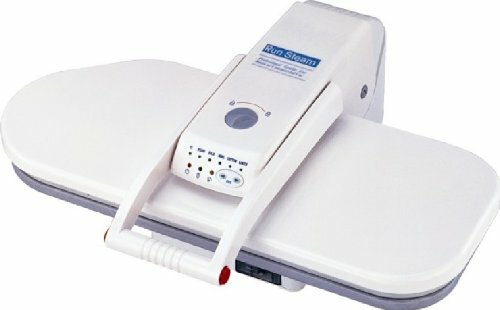 When I read the reviews I noticed that people suffering from those types of ailments, turned to an ironing press for an easier to manage solution. The video below shows how to actually use one of these ironing presses. As you can see it is a much simpler method of ironing. It does take a little practise to get the techniques right for different garments. Once you get the hang of that, then you can cut ironing time in half. That is worth the short learning curve in my opinion. The one shown above is the Blanca Press. However they all work on exactly the same principle as this one. You place the press on a table and switch it on. 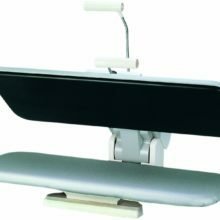 Many of the presses do come with a telescopic stand. That is what I personally prefer as it is easy to adjust the height. This one is for mainly commercial use. It is used in many hotels, guest houses and B&Bs. Some business owners also use these in businesses with high laundry such as nursing homes. 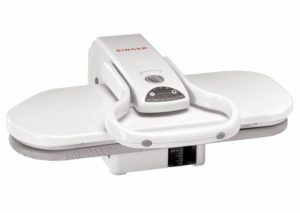 A press such as the Blanca has been designed to do a lot of ironing over a long number of years. As such the price point of £600 is probably too expensive for most home users. Below I have listed what I think are more affordable options. They work on the same principle. When it has warmed up you can then place your garment on the press, and bring the board down to press and iron the garment. It is a very fast and efficient method of ironing. TOP TIP – You get the best results with an ironing press, if the ironing is slightly damp. Below I have listed the top 5 iron presses by buyer rating, that are currently available in the UK. Underneath that you will find a full buyer’s guide, should you want to find out more about these. When it comes to high ratings and great reviews, this model from Speedy Press tops our list. It has an average price of £199, and buyers rate this model as a 4.9 out of 5 stars product. It is hard to get much better than that. 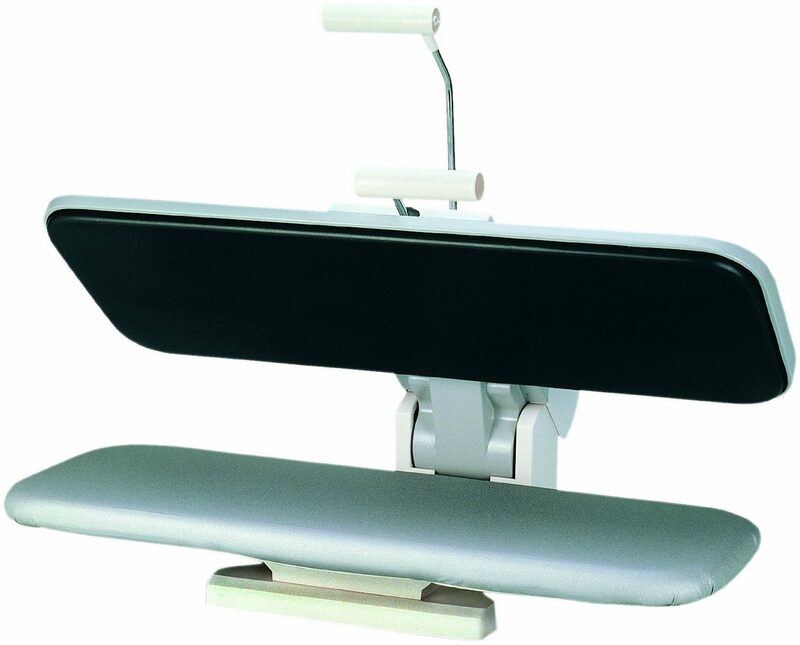 As you can see from the image above, this is a very nice piece of ironing equipment. This press comes with an extra cover, and also a foam under felt. You also get a measuring cup and a spray bottle. This one has been advertised a lot on TV, and it comes with a 12 month warranty. It can be used with or without the stand. Our second choice we think is also a very good one. The model above is from Speedy Press and this one is also from the same company. They are sometime referred to as The Ironing Press Company. This one is considerably cheaper at around £140. Buyers at Amazon UK have rated this model at 4.7 out of 5 stars. That puts it right up there with the very best of them. This one is smaller than the one above and does not have a stand. It is however light at around 9 Kg (About 20 lbs). This is a very popular choice with many UK buyers. Buyers like this one a lot. It is another in the Speedy Press range. Buyers like this one as it has a larger ironing area. That makes it ideal for getting through larger items, even faster than the standard size ironing press. It is about 10 times the size of a regular iron. It is also light in weight at around 10 Kg (22 lbs). This one costs around £160, and is rated 4.6 out of 5 stars, by buyers over at Amazon. Some people prefer the great brand name of Singer. This press does have a quality look and feel to it. This model is priced at around £165, and overall, buyers at Amazon UK rate this one as a 4.4 out of 5 star product. There are well over 100 buyer reviews. Generally speaking this is a popular choice from a very good brand. This 5th choice is also a Singer model. It has a slight variant on the one above. It is also newer to the market. There are not that many buyer reviews. Those that have left a review have rated this one as a 5 out of 5 star product. It is early days to see the true rating of this one, but so far so good. I will update this page if and when that changes. Above I have listed what I believe to be the top 5 steam press models currently available in the UK. I also like to include a buying guide to help people understand what features to look out for, before making their purchase. Nothing angers me more than buying something like this, and then it ends up in a cupboard somewhere. These do take a little getting used to. The first few times that you use one, you may well ask “Why did I bother?” Trust me when I say that after a few tries, you will grow to love it. For sheets, pillow cases, towels etc this is about as easy as it gets. For trousers and jeans it is also excellent. Now for those tricky items it takes some practise. Once you master the techniques, these presses truly will save you time. Be patient and reap the rewards. 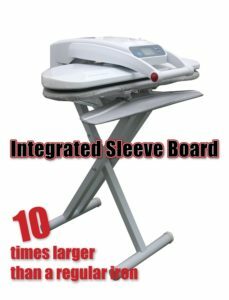 If you need to iron a lot of shirts or blouses, then consider buying one with what is called a sleeve attachment. Sleeves with any ironing method are a pain in the rear. Having one of these attachments takes the pain out of ironing these. If you look at the image to the left, you will see this small attachment just underneath the main board. This refers to the actual size of the ironing area. The best way to think of this is as follows. When you place an ordinary steam iron, or a steam generator iron on to the fabric, then it covers a certain ironing area. When you do the same using a press, then that ironing area is much larger. Most presses cover 10 times the size of the area. That alone makes this faster to use. Not only that but you do not have to move or press the area, as all of it is covered by the press. This is a key feature that is easily over looked. It should however be right at the top of your list. Using one of these is about as easy as you can get. All you need to do is set it up, turn it on, and spread the garment on the press. Then pull down the lid and let the press do the work. It is prefect for anyone with a bad back, who has problems with their hands, or for anyone who has to sit down. These presses do take the hard work out of ironing. These are actually a very good option and growing in popularity. Steam presses are honestly nothing more than larger steam irons. The only real difference is that they can press larger areas of clothing faster and safer. They are really good for ironing creases in shirts and trousers with a single press. One push with one of these, has about 5 times the amount of pressure, of a normal steam iron. The bigger the area of the press, the quicker it will iron. That is simply because they cover a larger area. So if your main job is to iron larger clothes such as sheets, then simply buy the one with the biggest surface area.